Great for electronics and tight spaces! Jâ€™utilise ce produit quand je veux faire un Ã©poussetage rapide avant mon mÃ©nage de la semaine. Jâ€™aime lâ€™utiliser avec un manche tÃ©lescopique que jâ€™ai depuis quelques annÃ©es pour les endroit difficile Ã atteindre. Ce sont les meilleures sur le marchÃ© Ã mon avis. Hard to attach the handle, and doubtful if the pick up dust very well. always great on dusts, easy & quick! What I can say... they are SWIFFERS DUSTERS!!! They are amaizing!!! makes your cleaning so much easy and fast, I bought them on sale so I love them even more!!! Love that they hold dust so well! These are great. Very quick and easy to use. Just the thing for light dusting. Swiffer dusters are nothing short of AMAZING! I had wanted the refills only, but accidentally chose this kit. I prefer to use the long handled swiffer duster. These dusters pick up and hold dust much better than anything I've ever used including an expensive ostrich feather duster and Norwex cloths. Once I've got a fairly dirty duster, I bring it outside and 'finish' it off getting all the yuckies off of my outside lights. Do yourself a favor and get these! SUPERB! I have enjoyed the use of this product. It is very efficient, save time and energy and even the kids use it to help clean their rooms. Very worthwhile investment. We hate dusting and hate dealing with the sprays. These are easy enough to use and the kids actually enjoy using it (sometimes as a sword fighting dust). I've been using this product more and more and love it. it's perfect for all those small openings and chair rails - oh and inside bowl style light fixtures and the tops of fan blades! Haven't pulled out a can of furniture polish in a long time. My recent purchase of "Swifter Dusters" was very satisfactory in every way. The product is first class and works very well, and from ordering to receiving, the shipping presented by Well.ca was exceptional, and by far the fastest and most informative of any I have yet to do business with on line. Many thanks, and I will be back. I bought this product sceptically, wondering if it would actually live up to the hype. I have to say - they do a wonderful job! And fast. I have noticed that the dust accumulates less quickly because I'm actually removing it rather than just moving it around. I'm a bachelor and hate dusting with a passion. I had seen these advertised on TV but was unable to find them up here in the Arctic. My apartment accumulates a lot of dust (especially during summer months) and this product makes my "hate-to-do" chore so easy. Love it! 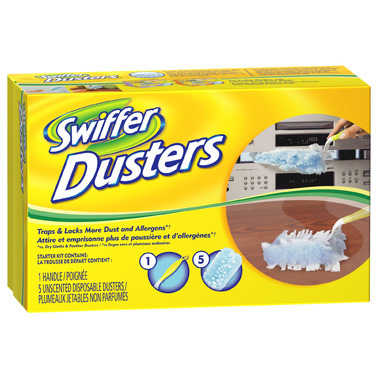 I've been looking for Swiffer dusters for so long, lately I've only been able to find the ones scented with Febreeze. We can't have added scents in our house due to sensitivity, so this is a great find for us. I like it,,easy to use and handy..